With the plethora of tantalizing food options before you, it can be tempting to overindulge during the holidays. However, there are many ways you can lighten up traditional holiday foods to stay on track with your goals this season. With simple ingredient swaps and just some slight changes in preparation, you can create a holiday dinner that won't weigh you down. Mashed potatoes are a staple side dish at holiday dinners - but unfortunately, they can be loaded with cream, fat, butter and sodium. Make a clever lighter version by using olive oil and reduced sodium chicken broth to flavor the mashed potatoes, while adding puréed cauliflower to the potatoes for extra nutrients. Wash and peel potatoes. Place in pot in stovetop, add water to cover and then bring to a boil. Cook until soft, then remove from pot and drain. Meanwhile, place the cauliflower florets in the Food Processor Attachment of the Oster® Oskar™ 2-in-1 Salad Prep & Food Processor and purée until smooth. Return potatoes to pot, then mash. Add the puréed cauliflower, milk, olive oil, chicken broth, garlic, parsley and black pepper and stir with mashed potatoes to combine until creamy, then serve. Create healthy holiday side dishes with the Oster® Electric Spiralizer. Instead of dousing vegetables in heavy sauces, syrups or creams, keep things light with this flavorful side dish dressed in festive red and green. Spiralize the zucchinis using the Oster® Electric Spiralizer. Next, slice the red bell peppers using the Oster® Oskar™ 2-in-1 Salad Prep & Food Processor. Transfer the zucchini spirals and the sliced bell peppers to a large bowl, then add the remaining ingredients. Toss thoroughly to combine. Prior to serving, heat mixture in a pan on the stovetop until warm. Sweet potato casserole has typically been off-limits to those looking to keep things light during the holidays - but no more! With this version, you can enjoy the classic dish guilt-free. Puncture potatoes with a fork, then place on a baking sheet lightly misted with cooking spray. Bake at 375 degrees until the potatoes are tender, about 50-60 minutes. Let cool, then remove the skins. 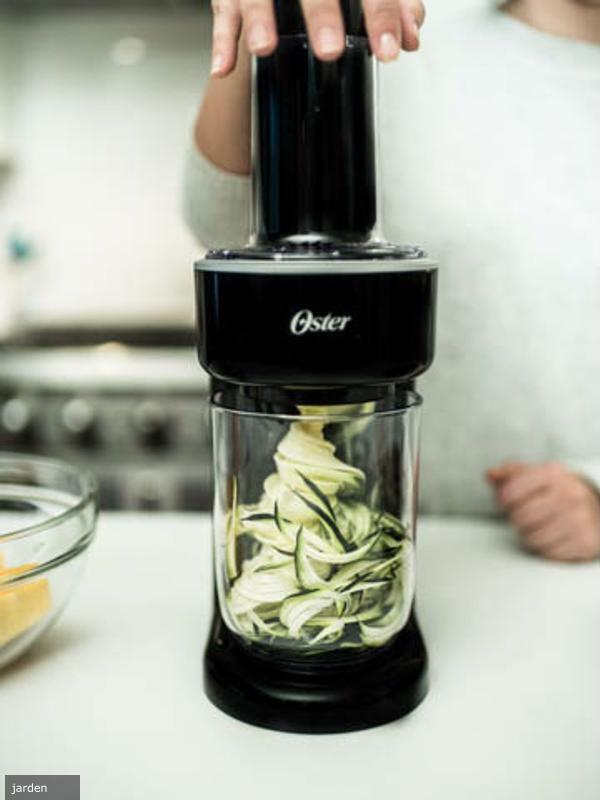 Cut potatoes in half then place in the Oster® Total Prep 10-Cup Food Processor with Dough Blade. Add the almond milk, coconut oil, vanilla, salt, 2 teaspoons cinnamon and nutmeg and combine in the food processor until smooth. In a separate bowl, mix the remaining 1 teaspoon of cinnamon, oats and maple syrup. Pour potato mixture into a lightly greased casserole dish, the top with oat mixture. Bake at 375 degrees until fully warmed, about 15-20 minutes. With fresh herbs, sweet dried cranberries and crunchy pecans, this festive, colorful side dish is just what your holiday table needs. Add rice, broth and water to the Oster® DuraCeramic™ Titanium Infused 6-Cup Rice and Grain Cooker with Steamer and cook rice until fluffy. Add the remaining ingredients and mix well until combined and warmed through.